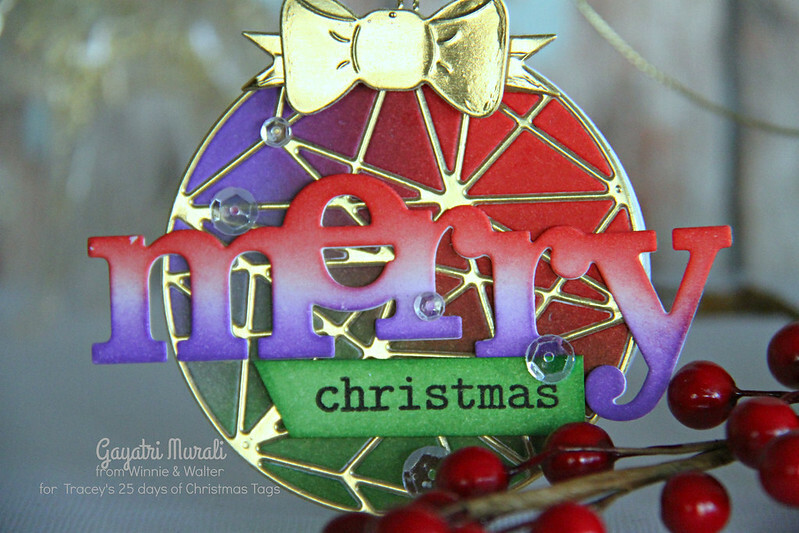 25 Days of Christmas Tags with Tracey – Winnie & Walter! I am participating in Tracey McNeely’s 25 Days of Christmas Tags today as a designer from Winnie & Walter. The gorgeous Tracey McNeely organises 25 Days of christmas Tags every year. Every day in the month of November there are some gorgeous tags made by some of the talented designers and each day there are prizes to be won from some wonderful sponsors as you can see below. Here is my tag using Winnie & Walter products. 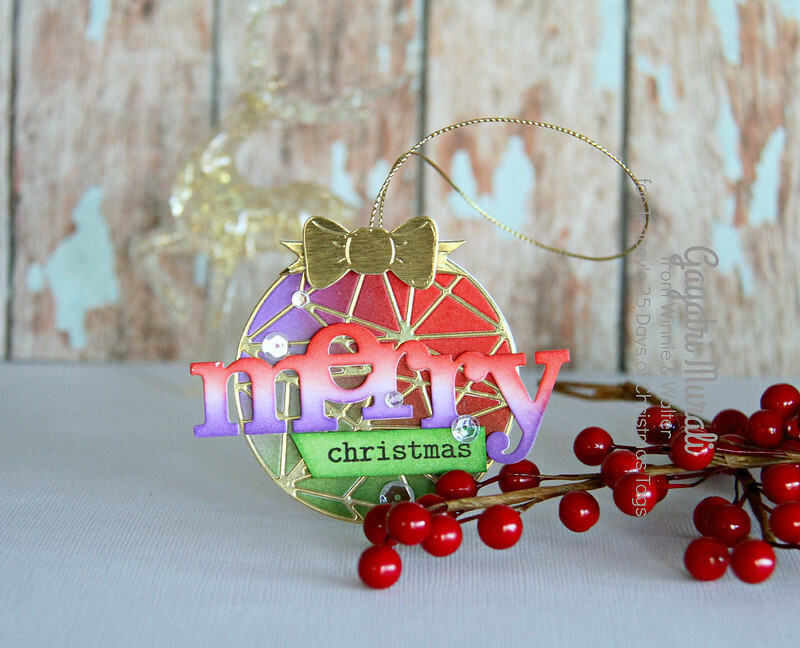 I have used Winnie & Walter’s True Multifaceted Circle Cutaway as my ornament tag. I die cut the multifacted circle die out of gold foil cardstock. I also sponged Candied apple, wilted Violet and Mowed Lawn on a scrap piece of white cardstock and die cut using the same die. I then die cut two circle dies out of white cardstock. I adhered the gold multifaceted die cut on the white circle die cut and inlaid the pieces from sponged multifaceted die cut. I scored on the top of the other white circle and adhered to the back of the multifaceted circle. So you one can write personal message inside. On the top of the multifaceted circle, I added a gold bow die cut using the Take a Bow cutaway. The sentiment is die cut using In a Word Merry cutaway. I sponged Candied Apple and Wilted Violet distress ink on it and adhered to the tag front. The smaller sentiment is from The Big, the Bold and Merry stamp set stamped using Versafine Black ink on a strip of cardstock sponged with Mowed Lawn distress ink. Finally I have added Sparkly Clear sequins. Head over to Tracey’s Blog and check out the details on how to enter a chance to win the gift certificate. Gorgeous! I love those colours together. So warm and festive, especially in combination with the gold. I love how sparkly an shiny this is, Gayatri! Just gorgeous! I love the gold outlining. Love the shiny and colorful goodness! Fabulous tag! Love the coloring. 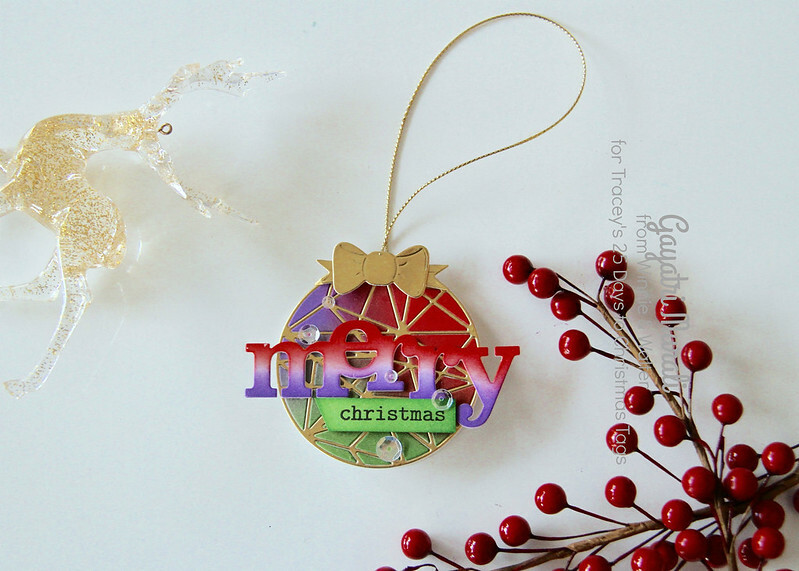 Beautiful colorful ornament tag, love it!! Oh I LOVE this shiny tag!! Great colors. The purple really POPS!! Such a beautiful tag!! Love the gold and the colors!